For the Win32/64:Napolar Trojan, the pipe used to inter-process communication is named \\.\pipe\napSolar. Together with the presence of character strings like "CHROME.DLL," "OPERA.DLL," "trusteer," "data_inject," and features we'll mention later, we have almost no doubts that the Trojan and Solarbot coincide. Let us look at some analysis. 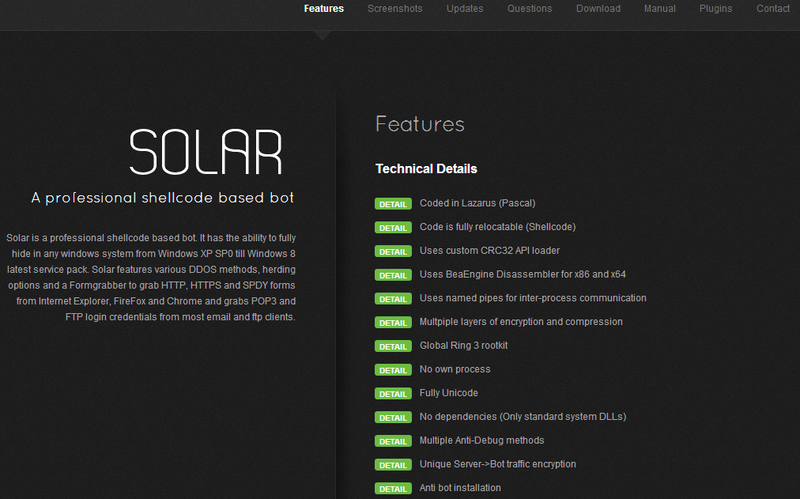 Information from the author's statement, says that Solarbot was written in Lazarus IDE for Free Pascal. We cannot recollect any professional or commercial Trojan that shares this property. On the other hand, we can not confirm that the analyzed binary is written in Free Pascal, because a lot of information in the PE header differs from the usual binaries compiled by Free Pascal. The initial x86 part also serves for a recognition of the system's architecture. In the case of a 64bit system, a correspondent module is extracted and loaded. The LDE64 (Length Disassembler Engine) is a 32 bit official tool based on BeaEngine able to decode instruction in 32 bits and 64 bits architectures. Disassembling could be needed for a fine modification of system functions (correct hooking with a custom one or emulating a chunk of original code). As described on the advertising page, all important WINAPI functions from KERNEL32.DLL, NTDLL.DLL, WININET.DLL, WS2_32.DLL, SHLWAPI.DLL, PSAPI.DLL are resolved by CRC32 hash (the constant table of CRC32 hash algorithm is found at the address 0xFF395A) and stored in a virtual table. 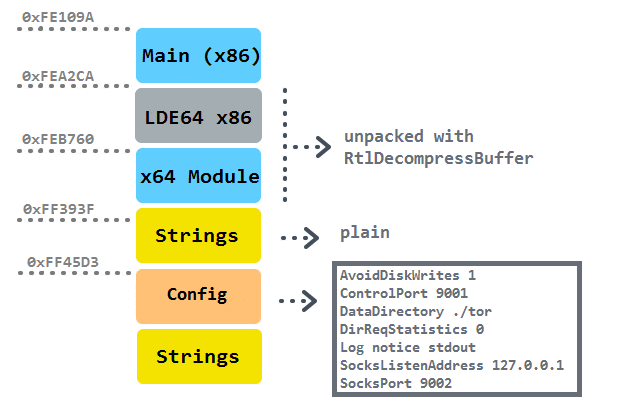 Also a few anti-debugging tricks related with IsDebuggerPresent and OutputDebugString functions have been observed. The bot after installation into %AppData\lsass.exe starts its instance at newly allocated memory at the virtual address 0xFE0000 and terminates itself. That means that it cannot be identified in the list of running processes. and the registrant's contact data are hidden behind PRIVACYPROTECT.ORG which is a service attracted by various groups involved in malicious activities. where s string denotes a key for a consequent RC4 decryption generated from a victim's environment and v stands for the bot's version. Number 1.0 suggests that we are facing the initial development stage of this bot. After a successful request, a response follows. As we mentioned, it is encrypted with RC4 and the right key is sent unencrypted in the POST query. The plain response structure takes the form of an array of strings separated with zero byte. Every string starts with a byte identifying a command number (a total of 15 various switch cases were observed) appended with a corresponding plain string. 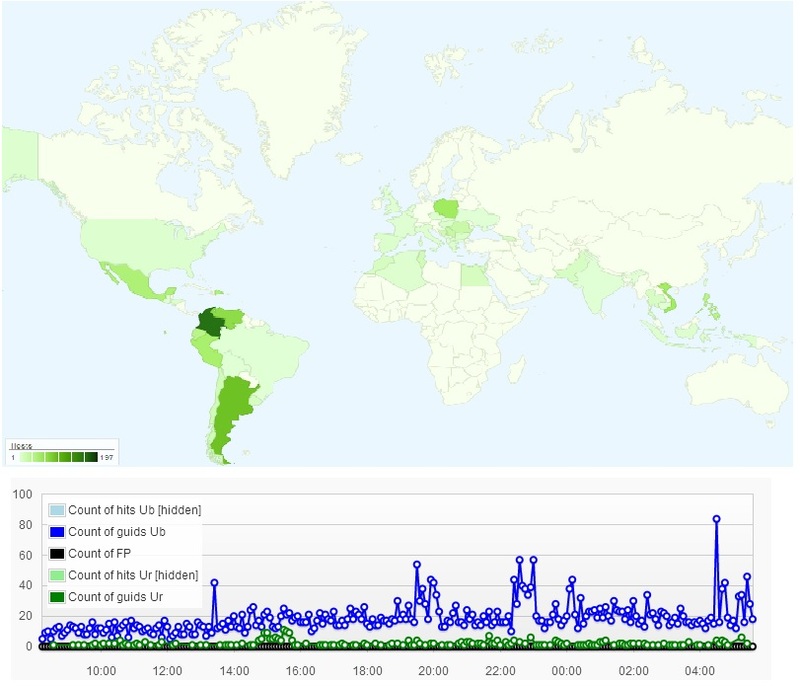 For a connection delay (command 0xC), it is the count of seconds (we have seen 3600 usually); for a command related to a download, it is a URL to a file followed by a control hash and a decryption key (command 0x12); for an installation of additional binaries serves command 0x2, e.g. a download of the Bitcoin wallet stealing plugin called WalletSteal.bin. By definition from bitcoin.org, a Bitcoin wallet is the equivalent of a physical wallet on the Bitcoin network which contains private keys that allows a user to spend the Bitcoins allocated to it in a public record of Bitcoin transactions. Actually, this is an example of the promised plugin support. The plugin is placed encrypted in the temporary directory SlrPlugin in %AppData. We have seen implemented functionalities like FTP and POP3 Grabber, Reverse Socks 5 or basis of functional modularity. There were relevant strings ("SSL", "http://", "http://", names of web browser libraries, "NSS layer", "data_start", "data_inject", "data_end" ) indicating the possibility of man-in-the-browser attacks. Indeed, we observed that the content of forms of internet banking sites were sent to C&C in an unencrypted form, but only in the case when the site requested a reputation or certificate verification. 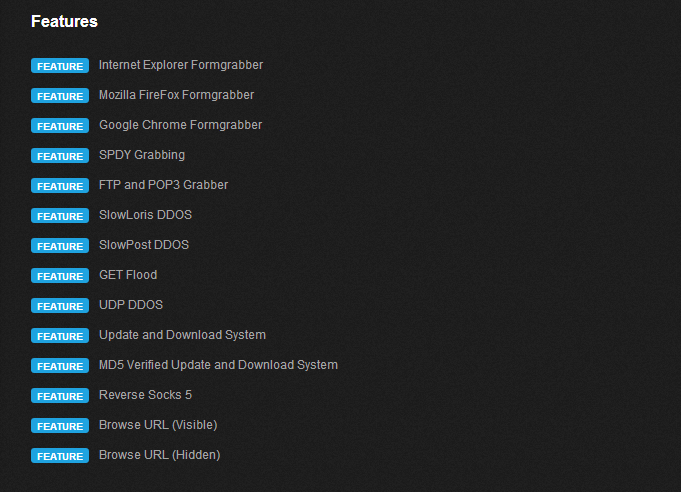 This could have connection with internal list of URLs (http://urs.microsoft.com/urs.asmx; http://ocsp.verisign.com; http://ocsp.comodoca.com; http://safebrowsing.clients.google.com; http://dirpop.naver.com:8088/search.naver), updated remotely with the internal command 0xF. Next, dynamically we have seen a download of a Bitcoin miner that was afterwards injected in a classic Windows notepad binary in the system's %Temp directory and executed (corresponds to the point "MD5 Verified Update and Download System" in the list). In the end, we have to say that this bot displays solid malicious performance. Together with the reasonable price of $200, it could be on the rise in the near future. Fortunately, the antivirus industry will react to make the life of these cyber-criminals harder.